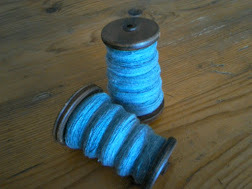 It's been a very busy few days since I last posted on the blog. And funny how sometimes things dont quite go to plan but turn out ok in the end. Firstly I was supposed to be helping my daughter in law at Witney Carnival with another Help for Heroes stall but had a very bad migraine and spent most the day in a dark room... at the end of the day she had raised an amazing £1000 ... Well done Carrie and her mum! Unfortunately my migraine's seem to come on when I have too many things crowding into my brain demanding my attention. My brain is not as big as it used to be... or else I have filled it up with rubbish and I need to do a good clean out! I continued to spend a couple of hours here and there at the allotment. The plan... according to the book I have Organic Gardening - The Natural No-Dig Way by Charles Dowding... is that you dont need to dig at all... but of course you have to dig out perrenial weeds initially before you can start the no-dig bit... which means that I have been digging and digging and digging. And while getting stuck in, a fellow allotment holder passed some chitted potatoes over to me saying that I should get them into the ground quick for a last new potato batch in October. Well, that was kind and I felt obliged to crack on and get them in. The thing is... since we are starting from scratch so to speak, I had planned a circular bed with a south facing path cut into it (you can grow more crops in a circle than you can in a row you see). 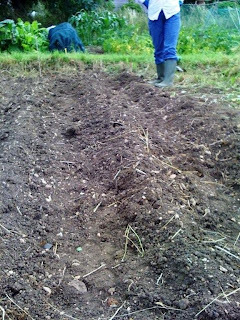 But I hadn't cleared enough ground for a circle and not wanting to appear ungrateful I had to plant the potatoes in a row! There is still plenty space to clear so I have decided that the next bit I dig over will be a circular bed. I plan to put a small apple or pear tree in the centre of the circle with lavender around the edge where the curve of the circle meets the straight edge of the allotment plot. Well ... that's the plan... but we shall see what happens! Keeping the potatoes company is three rows of French Beans for drying for over winter use and a row of Florence Fennel (which I am crossing my fingers about because I haven't exactly been successful with bulb Fennel before). Now I need to think about some kind of protection for the beans and possibly the fennel because of the deer. There is no water at the allotment but I timed the sowing just after a night of rain and then it rained the following day to water them in. Which was very kind of Mother Nature.